Suits: Afro or naturally curly hair. Try It: If your hair is a mass of crazy curls, you may be best to work with that rather than trying to attempt something that's too ambitious. 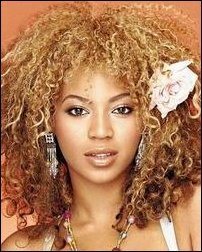 Beyonce's hair here is proof of just how gorgeous wild curls can be. Tease hair with an afro pick or a tailcomb (don't brush!) so that it's parted in the centre, coming forward, and accessorise those gorgeous curls with a big flower. Suits: Fine to medium long hair. Straight or wavy. Try It: While damp, put plenty of curl boosting mousse or spray all over hair. Put the hair into two or three plaits (braids) securing as close to the ends as possible with a slide or clip that won't 'dent' the hair like a band. Leave to dry in braids and then remove, shaking your head to loosen the waves you've created. Spritz with some strong-hold spray. Suits: Long Oriental or coarse Asian hair. Try It: To get Lucy's look, it's all about condition. Use an intensive conditioning treatment or oil on your hair and then leave it to dry naturally if possibly. Roll onto large heated rollers and leave to cool. Remove them and backcomb the roots so the bulk of the hair falls back, rather than in a parting. Part the front section on the side and smooth down and pin behind the ears. Finish the look with some serum. Suits: Fine to med, mid to long hair. Try It: This will take time, and you'll probably need a friend to help. Part the hair into inch-wide sections and twist each section back, holding it close to the head. Pin in place and once the whole head is done, gather in a ponytail. Now using spiral tongs, curl 1/2 inch wide sections until the whole ponytail is done. With shorter hair, just arrange the curls and spray with a strong-hold product. Longer curls may need to be pinned to the head. 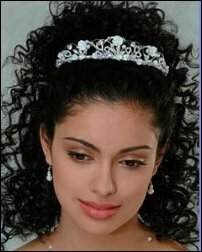 Suits: Naturally curly or curly afro hair. Try It: While hair is wet use a curl-boosting mousse or spray and scrunch dry with a diffuser to keep the natural curl and volume. 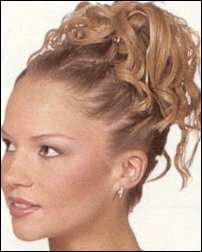 Pull the front section of the hair back into a half-ponytail and secure with a band or decorated grip. Now use some shine serum or curl-taming creme all over the hair to separate out the curls, scrunching to keep hair 'big'. Use tongs where necessary if you hair isn't curly enough, but don't be too 'uniform' about it. Try It: Pull your hair into a ponytail on the crown of your head. If you have layers, leave the shorter front section loose. Using wide-barrel tongs, 'roll' 2 inch wide sections of hair towards the head, remove the tongs and pin each roll to the crown. Do this all over the head. If you wish, leave the ends poking out. Now pull the front sections back with a tiara or alice band. Use tongs to roll the ends of these layers, pinning them to the head leaving the last inch spiking up.